Vancouver, BC, August 31, 2016, Consolidated Woodjam Copper Corp. (“Woodjam Copper”) (TSX-V: WCC) has completed induced polarization ( IP) and magnetic geophysical surveys on four target areas of the 100% owned Woodjam Copper-Gold Property located at Horsefly, BC, approximately 45 km northeast of the City of Williams Lake. MX200: 200 m depth slice showing the IP Chargeability Anomalies and 2016 survey grids. Click here or on the image to your right to see the Woodjam Compiled IP MX200 Slice Diagram. Please click here to download the original high res diagram as a .pdf file. MX400: 400 m depth slice showing the IP Chargeability Anomalies and 2016 survey grids. Click here or on the image to your left to see the Woodjam Compiled IP MX400 Slice Diagram. A four-line IP survey on the Megaton claims extended the Southeast Zone chargeability anomaly approximately 1.5 km further northeast to indicate an overall anomaly measuring approximately 4.5 km by 1.5-2.0 km. The Southeast Zone lies near the southwestern end of the anomaly and hosts a previously reported NI-43-101 inferred resource of 227.5 MT grading 0.31% copper (see news release dated May 15, 2013). In 2013 Gold Fields,the previous operator, drilled a hole 1.3 km northeast of the Southeast Zone that intersected the same intrusive phases and alteration as the Southeast Zone and returned 121 m grading 0.11% Cu. This hole is now seen to be located at the eastern edge of the newly extended anomaly. Two other reconnaissance holes were drilled just off the northernmost edge of the new anomaly and also intersected Southeast Zone style intrusions and returned anomalous values of copper and molybdenum. This survey greatly expands the discovery potential for the Southeast Zone. 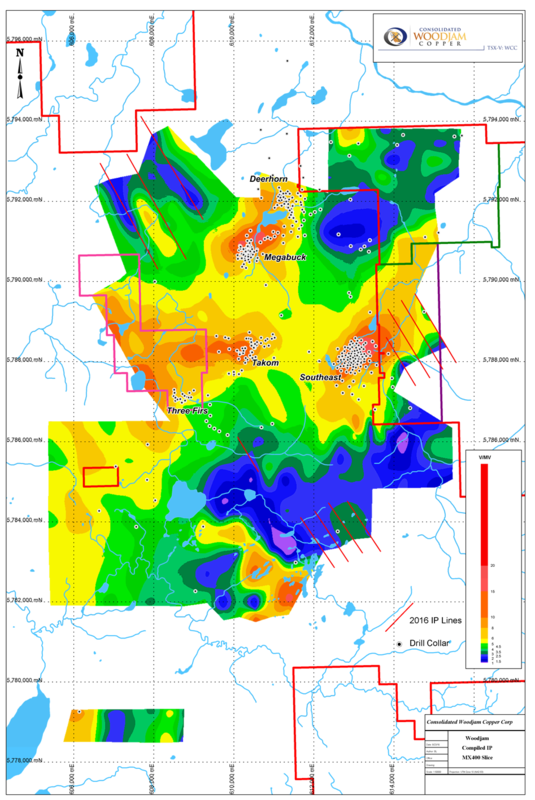 A small grid was placed to explore the region surrounding a Gold Fields reconnaissance hole 2 km south of Southeast Zone that had intersected potassic altered quartz-monzonite comparable to the Southeast Zone, with minor copper and molybdenum mineralization. The hole lies along the apparent edge of the Takomkane Batholith as does the Southeast Zone. 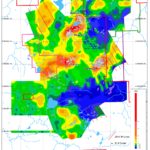 Approximately 50 m to 100 m east of the drill hole the edge of a chargeability anomaly was traced over a 100-200 m extent and is open beyond the grid. No other exploration work has been undertaken in this area and this is a new target that will need to be outlined by further surveys. This step-out exploration based on geologic modelling shows the excellent potential for discovery still available on the Woodjam Property. 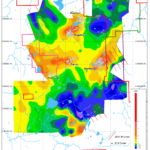 A third grid from a previous survey that indicated a potentially large IP chargeability anomaly was infilled with three more lines and resulted in outlining a 2 km by 1 km anomaly that will require drill testing to confirm whether or not the anomaly is mineralization related. A fourth grid was selected for in-fill survey lines where a chargeability anomaly had been previously partially outlined. Unfortunately only one line could be cleared for surveying due to the density of standing pine beetle killed trees that create a serious safety hazard to putting IP lines in the bush. The one line surveyed did not add to defining an anomaly. The Woodjam project is located in the Quesnel terrane of central British Columbia and is near the Gibraltar and Mount Polley Cu-Au Mines. Woodjam Copper purchased Gold Fields’ 51% interest in mid-2015 and they remain a 19.9% shareholder in Woodjam Copper Corp. From 2009 Gold Fields completed expenditures of approximately $25M, Previuos expenditures by the Woodjam Copper partners were in the order of $5M. This work resulted in the discovery of four new NI-43-101 compliant deposits and the outlining of several additional exploration targets. Woodjam Copper is continuing to pursue new discoveries on this district scale property which covers 61,869 ha and the recently completed geophysical surveys underscore the potential for doing that. G. L. Garratt, P.Geo., a qualified person for the purposes of National Instrument 43-101, has read and taken responsibility for this news release.